Rayference is a R&D company providing technical and scientific expertise in 1D and 3D radiative transfer modelling, both in the atmosphere and at the surface. 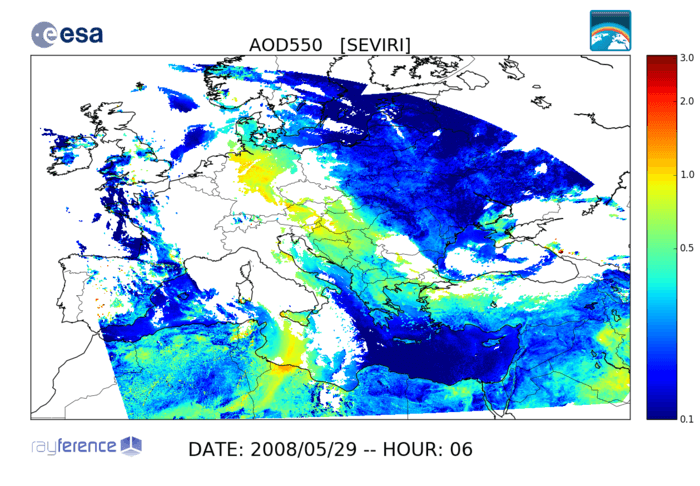 This expertise is applied in areas such as inverse modelling for the retrieval of aerosol and surface properties from space observations, vicarious calibration (metrology), solar energy, fundamental and thematic climate data record generation or sensitivity analyses for the preparation of new space missions and associated services. 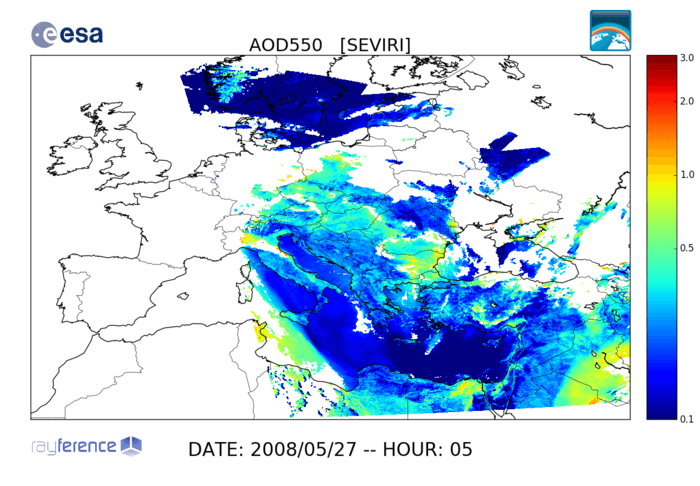 Rayference is specialized in the development of advanced algorithms based on the inversion of radiative transfer models. 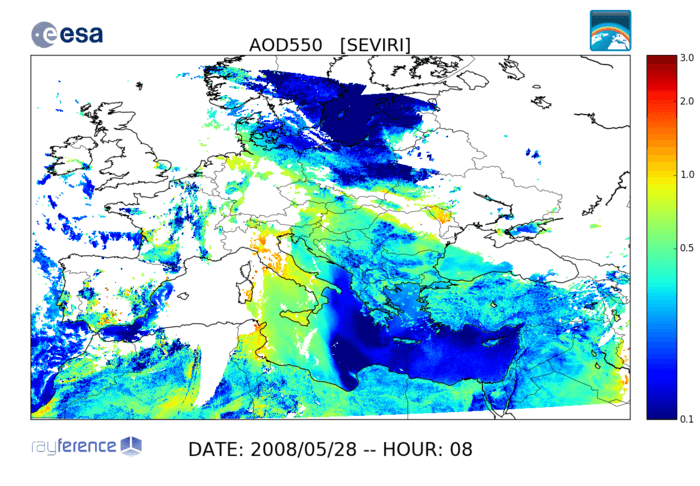 Rayference has developed the Combined Inversion of Surface and AeRosol (CISAR) algorithm which provides among others the surface reflectance, the single scattering albedo, phase function, fine/coarse mode ratio and the total column aerosol optical thickness. 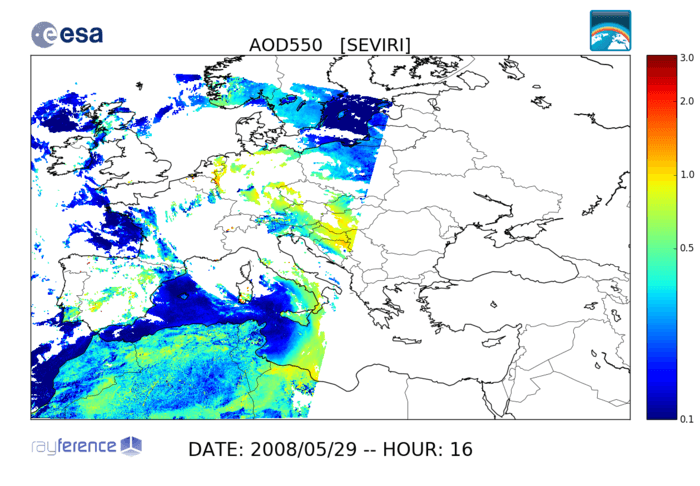 This algorithm is used in the context of the ESA Aerosol_cci project to retrieve hourly aerosol properties over land and sea surfaces from MSG/SEVIRI observations. 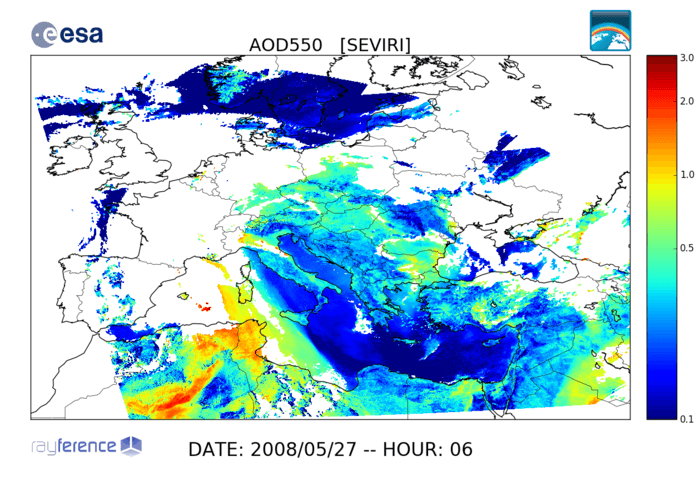 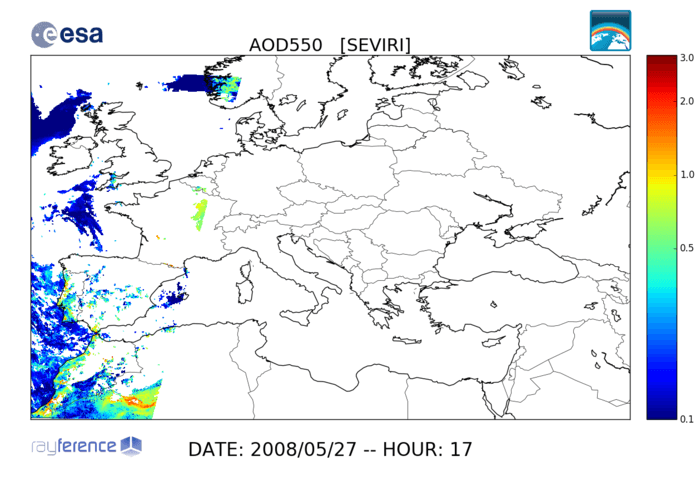 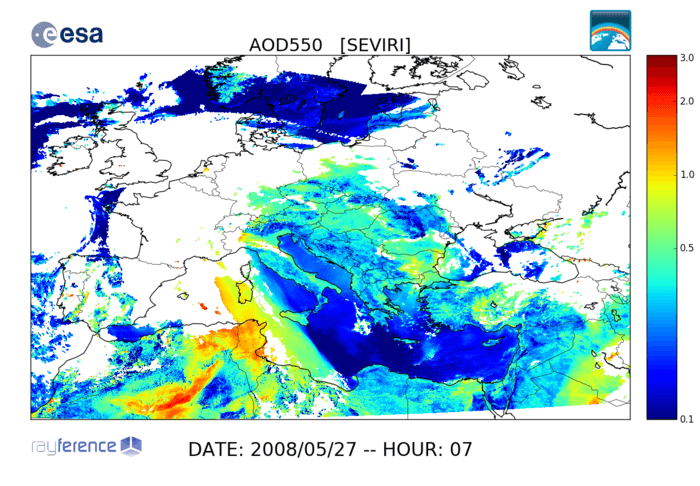 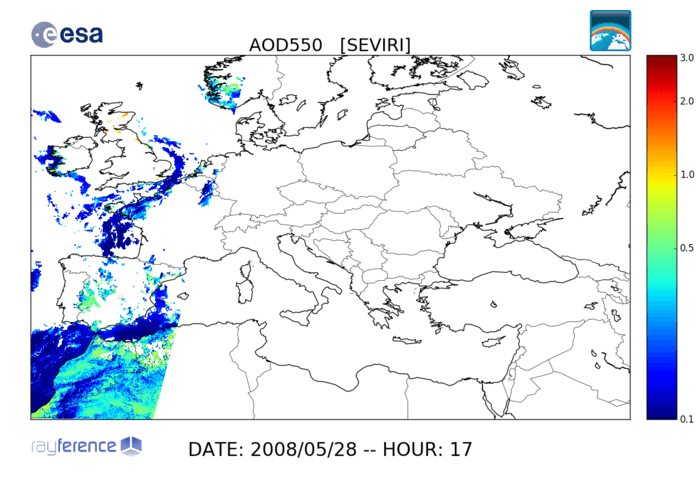 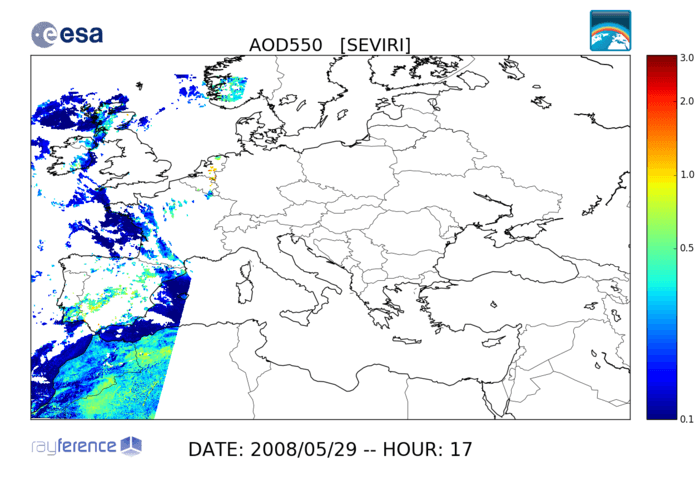 The figure shows an example of hourly Aerosol Optical Thickness retrieval during a dust storm occuring on 27 - 28 May 2008 over the Mediterranean basin. 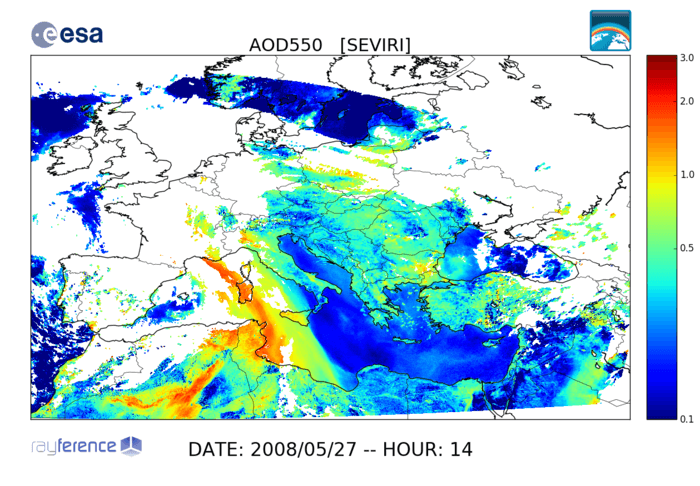 Rayference operates a suite of atmospheric and surface 1D and 3D radiative transfer models to perform sensitivity analyses, vicarious calibration, numerical algorithm design or look-up table generation. 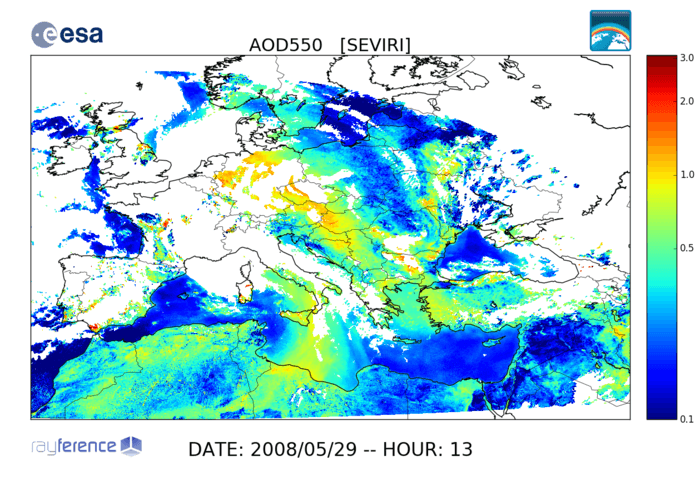 In the context of the MetEOC-3 project, Rayference has initiated the design of eradiate a new 3D Monte Carlo ray tracing community model to support metrological applications such as calibration and validation activities. 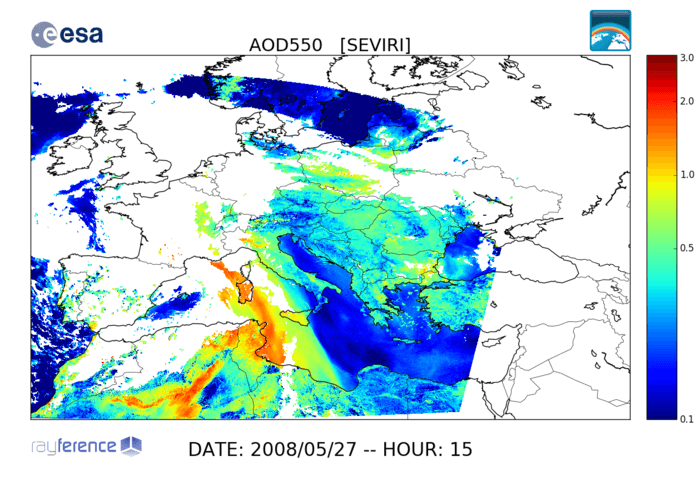 The 3D radiative transfer code Raytran is used to simulate Bidirectional Reflectance Factor (BRF) over complex scene which are described with a set of geometrical objects. Raytran also allows simulation of in situ observations. 1D simulation over dense vegetated surface in the red spectral region in the principal plane at the top-of-atmosphere (blue curve), bottom of atmosphere (green curve) and without atmosphere (red curve). 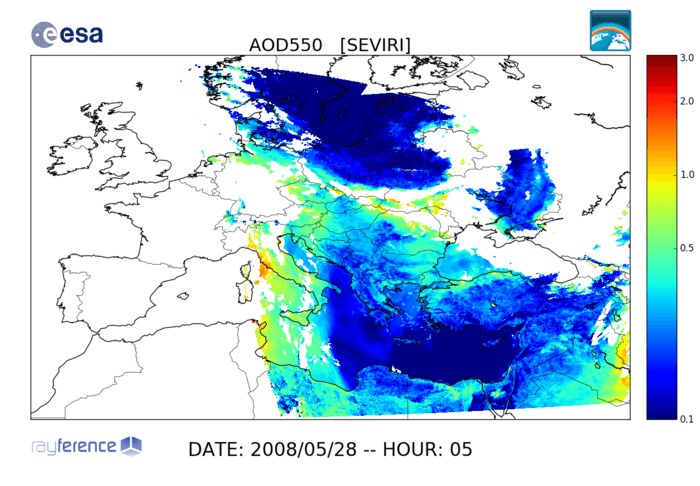 Rayference is using simulated top-of-atmosphere reflectance of desert sites to perform radiometer (cross-)calibration with an accuracy of about 3 to 5%. 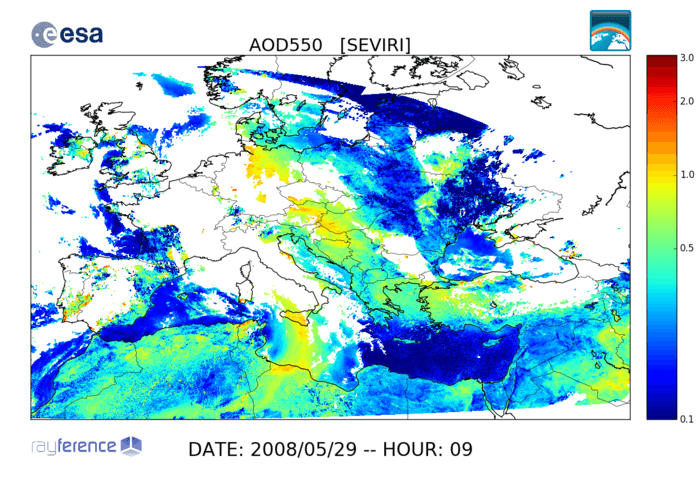 Rayference provides support and advices for setting up operational services based on the exploitation of space-based observations. 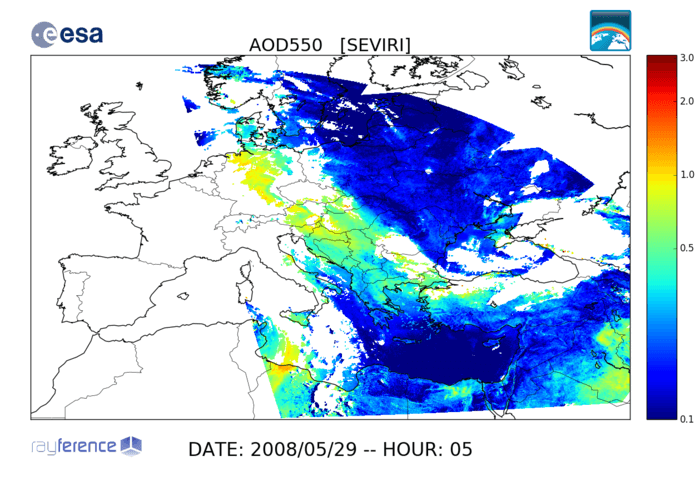 The objective of this project is to provide a set of global atmospheric (aerosol and cloud), and surface (albedo) products which are simultaneously retrieved using the same radiative transfer physics, under the same assumptions, and employing the same ancillary data from Sentinel- 3 SLSTR and OLCI observations. 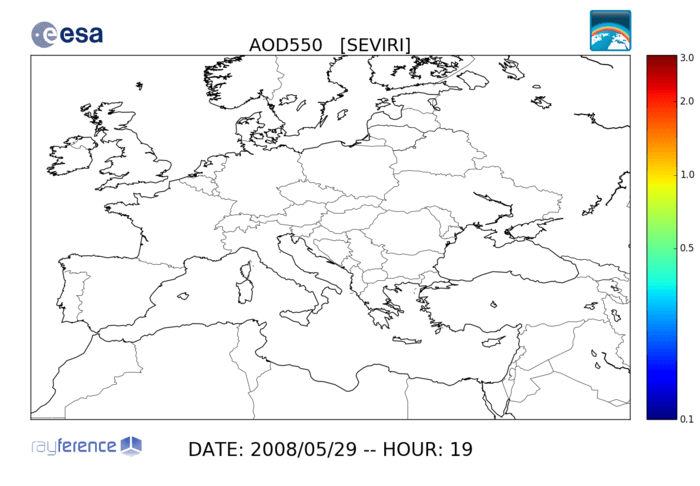 The CISAR algorithm will be used for this project. The overall aim of the project is to contribute to the establishment of the necessary metrology infrastructure, tailored to climate needs in readiness for its use in climate observing systems. Within this project, Rayference is establishing the needs in term of accurate 3D radiative transfer modelling and analysing the technical and scientific solutions to fulfil these needs. 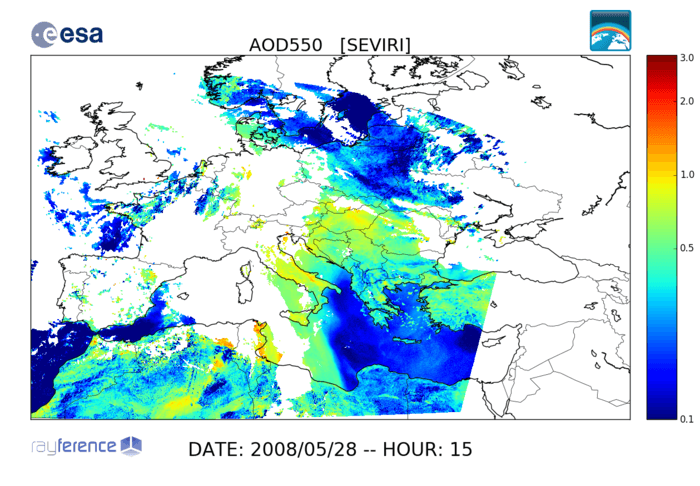 Sentinel-4 Level-2 Processor Surface Reflectance Component Development. The Fidelity and Uncertainty in Climate Data Records from Earth Observation (FIDUCEO) project will set new standards of accuracy and rigour in the generation of Fundamental Climate Data Records (FCDRs) and Climate Data Records (CDRs), with defensible uncertainty and stability information. 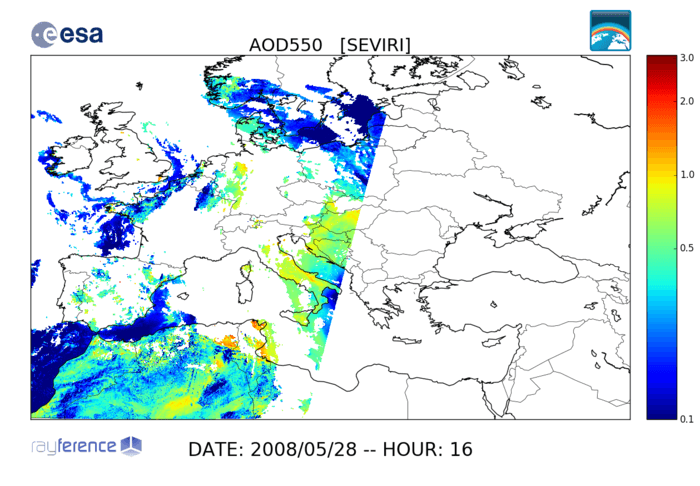 The S2RadVal (Sentinel-2 Radiometric Validation) project aims at developing and inter-comparing algorithms for validating the radiometry of Sentinel-2 Level-1 products. Quality Assurance for Essential Climate Variables (QA4ECV) is a EC/FP7 research project aiming at showing how trustable assessments of satellite data quality can facilitate users in judging fitness-for-purpose of the ECV Climate Data Record and providing quality assured long-term Climate Data Records of several ECVs relevant for policy and climate change assessments. 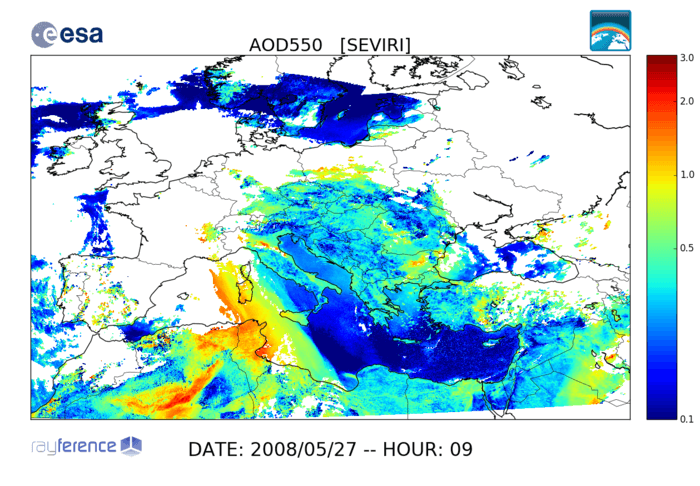 QA4ECV is paving the way of the future Copernicus Climate service. 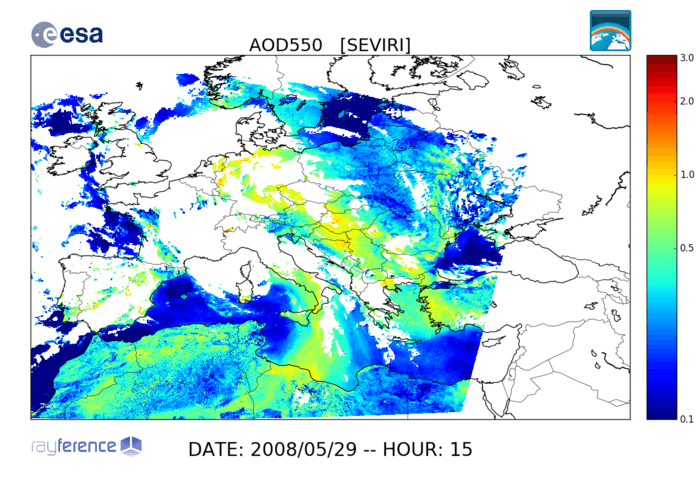 The aerosol_cci project aims at producing a set of global aerosol ECV products for one reference year from a set of European satellite instruments with substantially different characteristics. Rayference will be responsible for the generation of an aerosol data set from MSG/SEVIRI observations with the CISAR algorithm. The objective of this study is to perform a joint retrieval of surface reflectance / aerosol properties from PROBA-V observations with the CISAR algorithm. 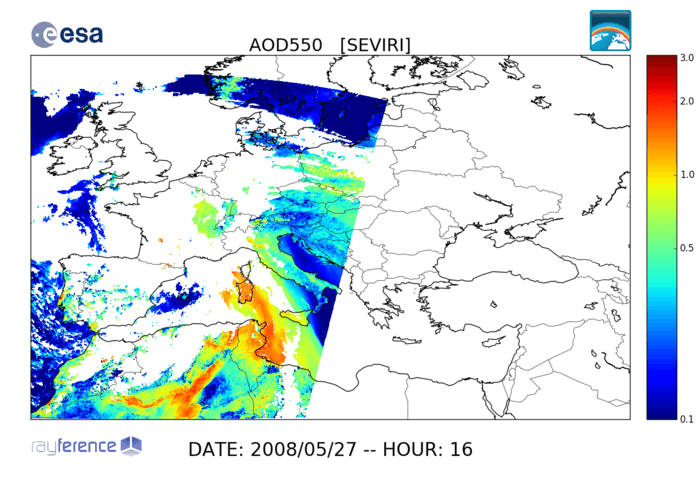 The objective of this study is the development of a Deep Convective Cloud reference radiative model to increase the capabilities of the currently-in-use operational vicarious calibration system for reflective solar bands used at EUMETSAT for the calibration of the solar channels of the geostationary solar channels. 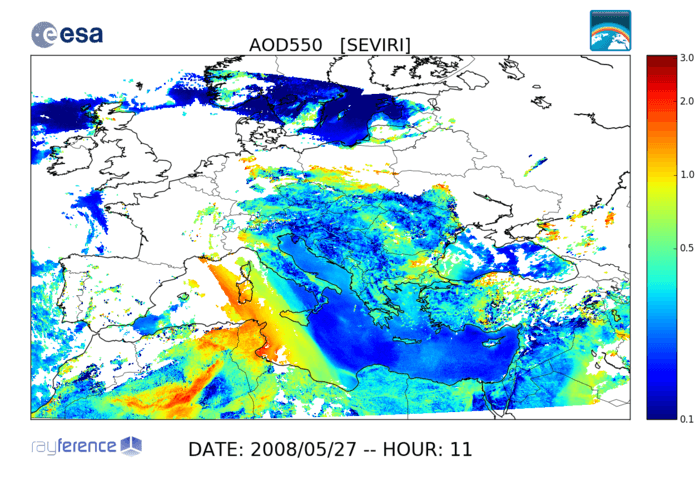 The study focuses on i) the identification in satellite images of Deep Convective Cloud targets suitable for calibration purposes, ii) the definition of the microphysical properties of a standard deep convective cloud target to establish the vicarious reference signal and iii) a methodology to implement this new type of calibration. The objective of this study is to support VITO with regard to the assessment of the 6SV Radiative Transfer Model performance for the vicarious radiometric calibration of a space-borne hyperspectral sensor in the 450-900nm spectral region. 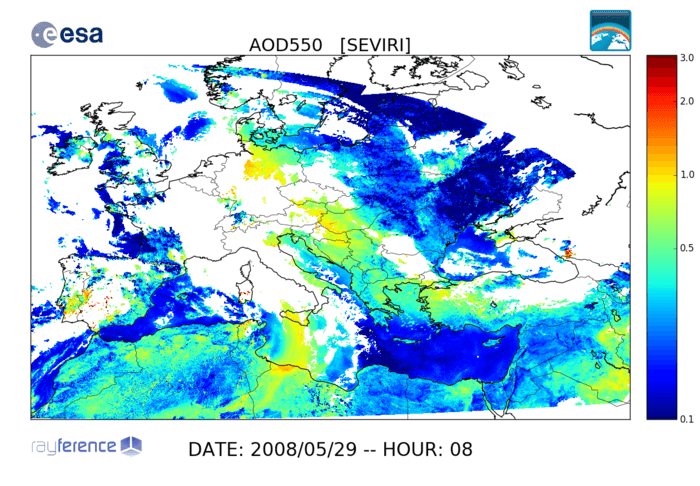 The objective of this project supported by the University Catholic of Louvain is to simulate top-of-canopy and top-of-atmosphere reflectance with a 3D radiative transfer model (Raytran) above a tropical forest to assess the impact of angular and atmospheric effects on satellite observations. 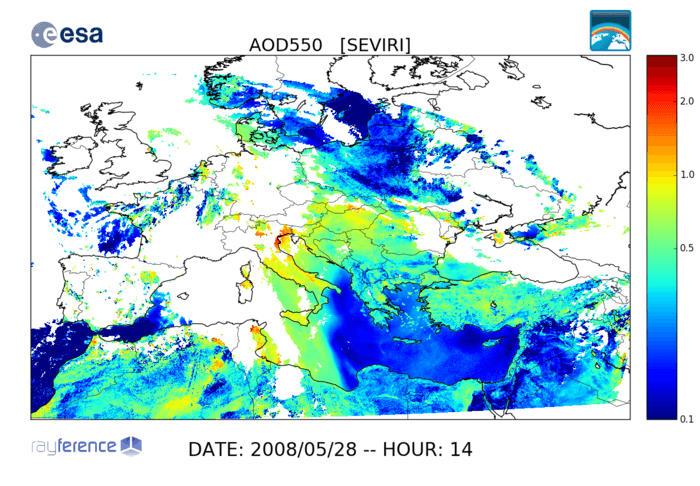 This ESA project targets the concept development for the daily UVN surface reflectance map product for Sentinel-4 building on relevant heritage concepts. The purpose of this project supported by VITO is to improve the characterization of bright desert surface radiative properties used for the vicarious calibration of PROBA-V.
We provide high quality service on the use of radiation transfer theory applied to the field of environment and climate monitoring as well as solar energy assessment. 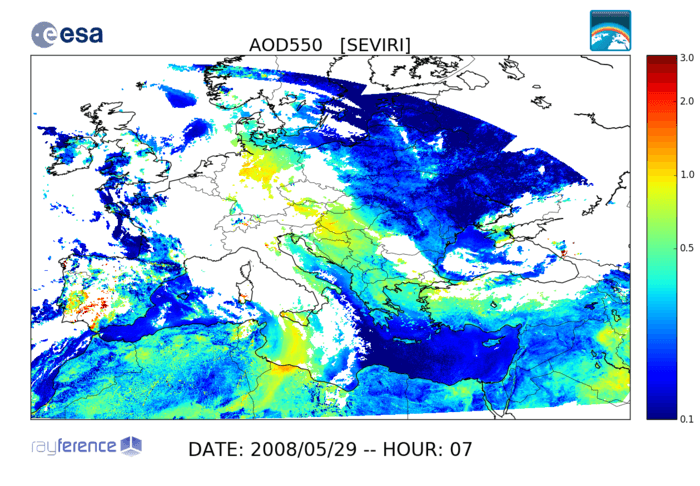 We are a team of physicists and engineers passionate by scientific challenges developing innovative solutions based on state-of-the-art research. 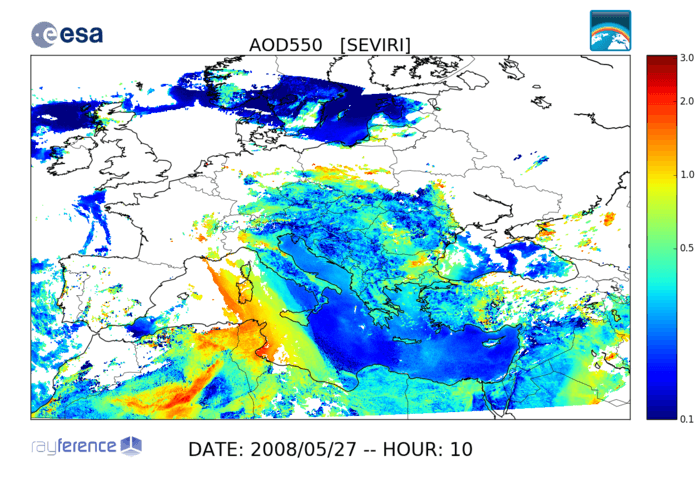 How many legs does have a dog ?